Have the skills? Write to us and introduce yourself. Background: The Marine Corps Reserve provides trained units and individual Marines to augment and reinforce active forces for employment across the full spectrum of crisis and global engagement. The US military is facing an increasingly contested operational environment, including operations in and through cyberspace. 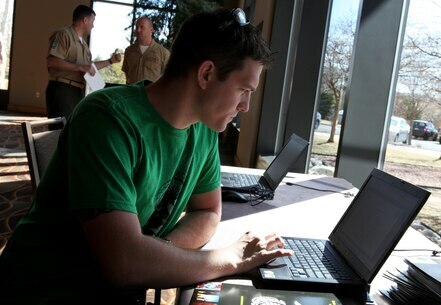 Marine Corps Defensive Cyberspace Operations (DCO) are part of a broader information environment spanning many domains, operations, and related capabilities (e.g. computer network attack, electronic warfare, information operations, and military deception). Purpose: Company A provides Defensive Cyberspace Operations-Internal Defensive Measures in support to Marine Expeditionary Force Headquarters Group (MHG), Marine component headquarters, and/or a Combined/Joint Task Force headquarters (C/JTF HQ) in order to enable and enhance the warfighting abilities of a Marine Commander. Situation: Information-related weapons are increasingly common and lethal on the battlefield. For example, in 2007 the Israelis purportedly employed cyber capabilities and electronic attack to suppress an enemy air defense network to destroy a suspected nuclear facility. More recently in Ukraine, Russia purportedly employed electronic warfare to target Ukrainian formations using long-range fires. Russian information operations purportedly continue to manipulate public opinions to shape the operational environment. Going forward, we must understand how new technologies, such as artificial intelligence, machine learning, autonomous systems, robotics, electronic warfare, cyber warfare, and social media will impact military cyberspace capabilities. With respect to the defense of our interconnected military systems, the demand signal is clear: we need more. DCO-IDM Definition: According to Joint Publication 3-12, Defensive Cyberspace Operations-Internal Defensive Measures (DCO-IDM) are the form of DCO mission where authorized defense actions occur within the defended network or portion of cyberspace. DCO-IDM of the Department of Defense information network (DODIN) is authorized by standing order and includes cyberspace defense actions to dynamically reconfirm or reestablish the security of degraded, compromised, or otherwise threatened DOD cyberspace to ensure sufficient access to enable military missions. For compromised DODIN elements, specific tactics include rerouting, reconstituting, restoring, or isolation. Most DCO missions are DCO-IDM, which include proactive and aggressive internal threat hunting for advanced and/or persistent threats, as well as the active internal countermeasures and responses used to eliminate these threats and mitigate their effects. For example, Cyber Protection Teams (CPT) operations conducted on key terrain in cyberspace for mission-critical assets in response to indications of malicious cyberspace activity are DCO-IDM missions, even before indicators of compromise are apparent. Tradecraft: In terms of equipment and tradecraft, DCO employs a variety of custom, commercial, and government tools using an adaptive approach. Have the skills? Write to us and introduce yourself - we will look forward to talking with you. Feel free to send along your GitHub page, cyber experience, or original research. The DCO-IDM team is made up of geeks, cyber professionals, innovators, and information technology leaders. Captain McCartney is a native of Rochester, New York. He attended the PLC-Combined class of OCS and completed the course with the highest academic average out of 600 of his peers. He graduated from Brown University in 2009 with a Bachelors of Science degree in Applied Mathematics and Economics, and was commissioned in the United States Marine Corps in June of that year. Upon completion of The Basic School in January 2010, Second Lieutenant McCartney attended and graduated as the honor graduate from the Basic Communications Officer Course in June 2010. He reported for duty to 3d Marine Regiment in Kaneohe Bay, Marine Corps Base Hawaii where he was assigned as Platoon Commander of the 120-man Communications Platoon. In March 2011, he was chosen by Colonel Bierman, Commanding Officer of 3d Marines, to deploy as an Individual Augmentee Infantry Officer with Landing Force Cooperation Afloat Readiness and Training (LF CARAT), where he served as the company’s Weapons Platoon Commander. Upon returning from deployment, Captain McCartney took over as the S-6 of 2d Battalion, 3d Marines, and he deployed with that unit on the first resumed rotation of the Unit Deployment Program (UDP) to Okinawa, Japan, where it conducted over 15 bilateral and multilateral exercises spread throughout the Pacific. Upon returning to Hawaii, Captain McCartney was assigned as the Officer-in-Charge of the battalion’s preparations for both the Commanding General’s and the Field Supply Maintenance Analysis Office (FSMAO) Inspections. Following Active Duty, Captain McCartney served as the Communications Officer for Combat Logistics Battalion 25 in Red Bank, New Jersey, and then as the S-6A and Communications Officer for 23d Marine Regiment in San Bruno, California. He currently serves as the Company Commander for the Defensive Cyberspace Operations – Internal Defensive Measures (DCO-IDM) Alpha Company in Concord, California. In his civilian career, Captain McCartney completed a Master’s degree in Computer Science in May 2015 at Rochester Institute of Technology and began a career as a software engineer at Google. He has also worked as a Technical Program Manager at Facebook, running the company's external cybersecurity training programs with a special focus on the veteran population within the Bay Area. Captain McCartney’s formal school completions include The Basic School and Basic Communications Officer Course. His personal decorations include the Navy and Marine Corps Achievement Medal (2nd award).